The prevalence of compassion fatigue is a critical reality for oncology nurses and lay navigators. The factors that contribute to, or help stave off, compassion fatigue have been studied by leading academic minds and by healthcare administrators. One of the key factors in predicting the likelihood of the onset of compassion fatigue is an individual’s resilience quotient. Resilience is the ability to bounce back emotionally and physically following an emotional or physical fall. It has been said that success is not the absence of failure, but the ability to persist in spite of it. This attitude is at the heart of resilience, and it is key to warding off compassion fatigue. But how does one build resilience? The following sections provide insights into compassion fatigue, the related but separate topic of burnout, and the relevance of resilience to oncology navigators. The concept of compassion fatigue arose out of the research and observations of Charles R. Figley, PhD.1 He defines it as a combination of burnout and secondary traumatic stress, which is stress that is caused by the emotional burden of wanting to help people who are suffering. The prevalence of compassion fatigue among oncology nurses has been recorded as ranging from 8% to 38%.2 There is a tendency in healthcare to confuse compassion fatigue with burnout. The 2 concepts are closely correlated and often arise out of similar circumstances, but they are different. 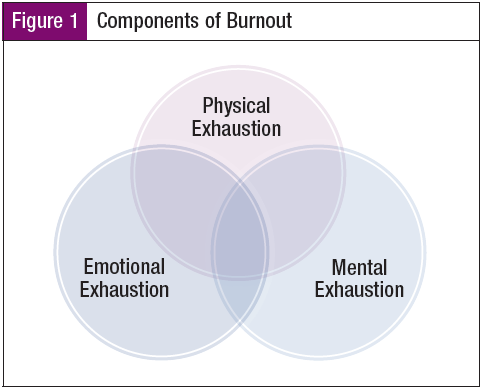 Burnout is defined as cumulative stress from the demands of daily life; a state of physical, emotional, and mental exhaustion caused by a depletion of the ability to cope with one’s environment, particularly the work environment.3 Burnout develops in response to repeated, chronic stress (Figure 1). 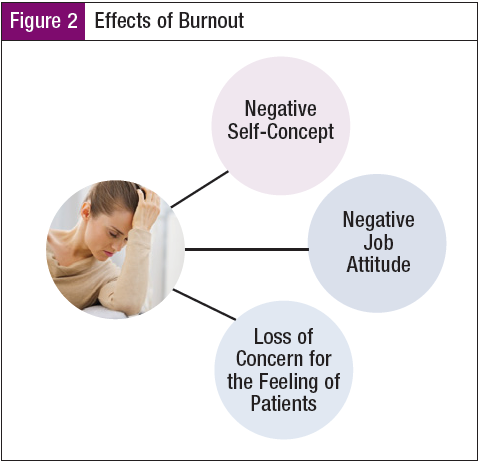 Burnout is a syndrome of physical exhaustion, including a negative self-concept, negative job attitude, and loss of concern for the feeling of patients.4 Characteristics of burnout include a loss of enthusiasm for work (emotional exhaustion), feelings of cynicism (depersonalization), and a low sense of personal accomplishment (Figure 2). Research has shown that oncology nurses have a high risk for burnout because of their intense emotional involvement with patients and families and their diminished sense of accomplishment when patients perish.4 Compassion fatigue can have a negative influence on performance at work and negatively impact the personal lives of those suffering under its influence. Given that compassion fatigue can also be a significant factor in job turnover or dropping out of oncology altogether, health administrators cannot ignore it because it comes with a potential economic cost. What is the key to avoiding these pernicious emotional states? Researchers point to emotional resilience as key. Resilience refers to the skills, abilities, knowledge, and insights that accumulate over time as we learn to overcome adversity and deal effectively with challenges. Therefore, it seems that the short prescription for avoiding compassion fatigue and burnout for navigators is to develop the ability to self-replenish when emotions are drained by life circumstances or work. Resilience is also about learning to recognize emotional and physical fatigue and moving quickly to fill back up before hitting the hard empty point. When people reach their emotional limits, it is natural to seek comfort and relief from this stress. However, it is crucial to select outlets that don’t feed negative addictive behaviors or remove the sense of self-awareness. Indeed, one of the keys to recovery and building emotional resilience is acknowledging emotions, not medicating them. Therefore, when facing potential compassion fatigue and burnout symptoms, try to limit the use of alcohol or medications that may weaken self-control and cause additional negative consequences. In light of the above information, one key to developing resilience might be to concentrate on changing negative life attitudes. It takes practice and persistence to reframe events positively, if it is possible. Granted, not every event can be reframed positively. The goal is simply to reduce overall negativity. Nursing has been called a 24-hour profession, as the emotional burdens of work often follow nurses home, invading every waking and sleeping hour. This 24-hour weight can be a key factor in developing compassion fatigue and burnout. An important weapon against the emotional drain of nursing is having a strong social support system. Social psychologists assert that social support is key to overcoming emotional strains and improving your off-work hours. If social networks prove useful for patients coping with cancer, then they are equally valuable for nurses, or navigators, who are caring for these patients and carrying similar emotional burdens. A social support network is made up of friends, family, and colleagues. Your social support system is there to help you during the good and bad times. A social support network provides a sense of belonging and feeling of security. Social support networks also provide a safe place to express and receive support and help to push way feelings of isolation. Finally, a social support network creates an environment in which one can experience positive states, feelings of acceptance, and caring. While some people may have an innate bent toward resilience, one essential element to building up resilience is recovery time. Chronic stress without recovery time can have damaging emotional and physical effects. Built into the recovery time should be activities or moments of contemplation that create opposing, positive forces that help to push away the negative thoughts that tend to cling too long. Shockney identified multiple strategies to combat the stress that can be a contributing factor to the emotional duress that can lead to compassion fatigue.8,9 Some of these strategies are very practical, such as exercising and eating right. Other habits, like keeping a daily journal, may be just as hard to adopt as exercise, but journaling on a consistent basis can shed light on how moods and attitudes are changing over time and highlight in black and white the need for interventions. What Are Navigators Saying About Stressors? 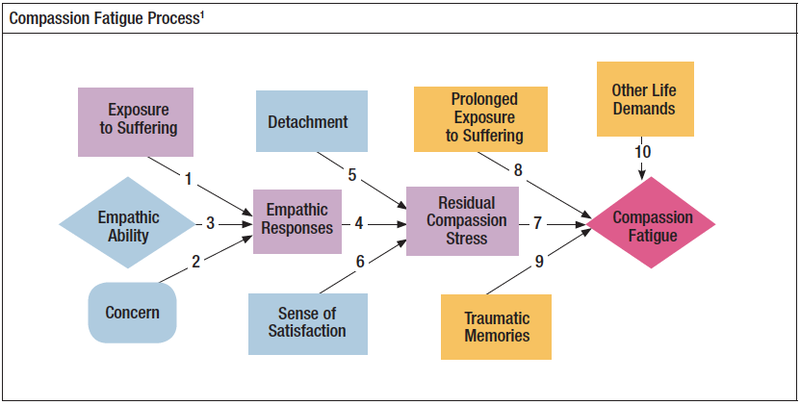 In terms of navigation, what are the daily sources of negative stress? For each of these negative feedback sources, there are outlets for relief, or change. For navigation leaders, a key intervention to address compassion fatigue, burnout, and secondary stress is an assessment of the emotional health of the navigation team. The assessment can take many forms, but it should be done on an annual basis to develop baseline and trend data so concrete interventions can be introduced if needed for specific team members. Several prominent research papers have validated the usefulness of the Professional Quality of Life (ProQOL) R-IV10 survey as an instrument that can be used to assess the emotional health of healthcare workers and measure risk for compassion fatigue among oncology nurses.2 The nurse navigation team within Sarah Cannon Cancer Institute at Medical City Healthcare completes the ProQOL survey biannually, and the results are reviewed with the navigation team, individual team members, and senior leaders. One of the challenges in addressing compassion fatigue and burnout is the assumption that they are an inevitable spiral that cannot be stopped or prevented given the constant flow of negative emotions, which can be ever present for navigators. Developing emotional resilience can help navigators safeguard against compassion fatigue and burnout. While some people are more naturally resilient than others, it is possible to develop this capacity and to reinforce it through positive thoughts and associations. Intentionally measuring team members for signs of compassion fatigue and burnout, along with implementing resilience strategies both personally and within navigation teams, can impact the future self-care for navigators and consequently improve patient care overall. Figley CR. Renewing Spirits: Lessons from Thirty Years of Trauma Work (Keynote address). William Wendt Center for Loss and Health Conference on Illness, Grief & Trauma. October 6, 2001; Washington, DC. Potter P, Deshields T, Divanbeigi J, et al. Compassion fatigue and burnout: prevalence among oncology nurses. Clin J Oncol Nurs. 2010;14:E56-E62. Maslach C. Burnout: The Cost of Caring. Englewood Cliffs, NJ: Prentice-Hall; 1982. Gentry E, Krigel S, Long T. Finding Your Balance (continuing education presentation), Academy of Oncology Nurse & Patient Navigators Annual Conference; June 6, 2018; Webex. Mulhern M. Managing the Stress and Change that Comes with Illness. The Center for Hope and Healing, University of Kansas Health System. Program synopsis. 2018. Youssef CM, Luthans F. Resiliency Development of Organizations, Leaders and Employees: Multi-Level Theory Building for Sustained Performance. In: Gardner W, Avolio B, Walumbwa F, eds. Authentic Leadership Theory and Practice: Origins, Effects and Development. Oxford, UK: Elsevier; 2005:303-343. Lyubomirsky S, King L, Diener E. The benefits of frequent positive affect: does happiness lead to success? Psychol Bull. 2005;131:803-855. Shockney LD. Preventing Burnout and Compassion Fatigue Among Providers Caring for Patients with Metastatic Cancer. In: Fulfilling Hope: Supporting the Needs of Patients with Advanced Cancers. Hauppauge, NY: Nova Science Pub Inc; 2014. Shockney LD, ed. Team-Based Oncology Care: The Pivotal Role of Oncology Navigation. Cham, Switzerland: Springer; 2018. Stamm BH, Stamm HE. Professional Quality of Life Elements Theory and Measurement. www.proqol.org. JaLisa Boyd, Gentry E, Narvarte K. A quantitative and qualitative quality-of-life evaluation of a large navigation team. Journal of Oncology Navigation & Survivorship. 2017;8(11):526.